Happy Birthday A Far Cry From Home! Well today is the day! The role-play A Far Cry From Home was started one year ago today, and is still (slow at times) going strong. Now we celebrate the year it started, and now the day it ends. Our last posts are coming and the new thread is starting! This party is to celebrate the longest running role play that I (assume) Distant Horizons has seen. Here is the link to our new thread and when the old one is archived that one will be posted too! Elizabeth (also known as Pirate-Liz) loitered around the room and busyed herself with the decorations. She carefully set a cake on a table. "Matsu, would you light the candle?" Matsu, who had been busying himself trying to stay away from Hati and not become baby-sitter to Abeni, looked up from his chair. "I suppose so.." He said softly, moving towards the table. "I brought the Fire Flakes!" TGM stumbles into the room with an enormous bag in her arms. "Fenny, be sure to get that soda out of the trunk, will you? We want to make sure we have plenty of punch-oh!" TGM acciddentally bumps into Matsu, unable to see where she is going. "Sorry!" Matsu let out a yelp and reeled back, his hand gripping the table in order to keep himself from falling. It wobbled dangerously. "MATSU!" "I'm sorry!" He peered around TGM, looking for Fenny now that he heard her name. Elizabeth wrinkled her nose and took some of the load from TGM. "You know, these things aren't all that great." "If you don't like them, you don't have to eat them." said TGM with relief as Liz took some of the load. "I think they're pretty good: like hot 'n spicy corn chips. Don't you think so, Matsu?" Fenny came through the door, lagging a bit as she tried to balance several bottles of soda she was holding and not really paying attention to the ensuing conversation. Much to her chagrin, TGM had gotten her out of her desert travel clothes and into a clean blouse and pants. "Exactly, look, corn chips only help perpetuate the idea of rednecks in middle class America, they're really disgusting-"
"I think they're good." Matsu interupted, shooting Elizabeth a look. "Can I help you Fenny?" He blushed softly and went to grab one of the soda bottles. "Oh look, the peasents are already getting cozy." Hati said boredly as she bended her drink in and out of her cup. TGM gave a small frown at Hati's comment. "Did you have to invite her?" she asked Liz under her breath. "Oh! Hey! Thanks!" Fenny greeted Matsu merrily. "Do me a favor?" she asked out of the corner of her mouth as they walked to the far side of the table, away from Hati. "You aren't the one who has to live with her, of course I did. You think I want her waking me up at night screaming in my ear?" Elizabeth hissed back. "If Noa comes I'm sure she'll calm down then..at least maybe she'll scream at him." Matsu nodded, stepping carefully over Abeni's leg as she hid under the table. "What is it?" He murmured. "I want to spike Hati's drink." Fenny murmured under her breath, so quietly Matsu would have to lean in to hear, and thus no one else would. "I think it would do us all some good if she was a little more... lax. But I need someone to run a distraction for me." She set a couple more bottles down on the table. "Well she sure isn't going to help Matsu any." TGM smiled wryly as she picked up some decorations to put up. "Most of us need Hati like we need a hole in the head." Elizabeth rolled her eyes as she continued to decorate. "Think anyone will come? I'm a little worried about the idea of Geming coming. Then again if he comes, Abeni will come out from underneath the table at least." "I heard that hole comment!" Hati scowled feircly in the general direction of Elizabeth and TGM. Matsu almost dropped the bottle of soda. "You want to what?" He stared agape at her. "After what happend to us...and you want to do something like that to someone else..??" Fenny took the bottle of soda from Matsu and put it on the table with the others. "Totally different situation. No one's trying to murder Hati. At least not yet." the corner of her mouth twitched with a smile. " And it would be in a much smaller amount, and diluted. Just enough to get her to stop being so..." Fenny raised her eyebrows. "Anyway, I know Liz and TGM would appreciate it. And Noa wouldn't complain." "We're here though, we can keep Geming under control if he does anything too wild. And don't worry, I'm sure others are bound to show up soon." said TGM as she put up some streamers, making a face at Hati when the girl snapped at her. Sakura grabbed her friend's hand and swung her through the door. "Come on!" she yelled happily. In the height of the spin, Sakura let go, her face split into a happy smile. "Waaah!" Hyana closed her eyes, tears forming as she swung around on one foot. With a final spin, she fell flat on her face. "Hyana!" Sakura laughed, running over to pick Hyana up. "You okay? I know you were excited, but you didn't have to fall on your face!" "S'all okay," Hyana murmured, rubbing her eyes. Before Hyana could do anything else, though, Sakura dragged her over to the place where everyone else was crowded. "Yo people!" Sakura smiled happily. "I haven't seen you in some time. Thanks for the invite, Elizabeth. This is... Hyana Kino. She's kinda new." "Hello," Hyana said quietly. "It's very nice to meet you." She kept her eyes one the ground, and Sakura gave her a playful push. OOC- The more people the better! NOTE TO ALL PEOPLE: This party is only allowed one week of life! "Geming terrifies me to tell you the truth, worst part is I want to hug him." Elizabeth said with a flip of her hand. "I'm sure he'd kill me for it too." Her attention was drawn by the loud and entertaining enterance of Sakura and Hyana. She grinned widely and waved. "No problem, I invited everyone! I'm hoping we can get everyone here." She dropped the end of the streamer and nodded to Hyana. "Don't be to shy, no one will hurt yo-...I take that back they will. Just avoid Hati over here if you value your life. Fenny and Matsu are pretty calm..Abeni is under the table if you can coax her out." "I'm scared." A small voice quipped underneath the table. Elizabeth knelt on the floor, peering under the table. Matsu shook his head at Fenny, unaware of what was going on near him. "Fenny, I'm not helping you spike her drink. If Noa finds out you have alcohol then the situation will be even worse. I've never even seen him drunk..and I don't want to." Matsu frowned slightly. "He's hard enough to handle while he's sober." "But still, it's awesome that I get to be a part of something as nice as this." Sakura's smile widened. A happy aura seemed to radiate from her, and her smile was truly sincere. "I'll help you decorate," she added as Elizabeth dropped to the floor. Hyana dropped onto her hands and knees next to Elizabeth, and lifted up the tablecloth. "Is something wrong?" she asked gently. "It's okay to come out. We won't hurt you." Her curious nature had gotten the best of her. DBA trudged into the room, dragging an unwilling Saiki behind her. Neither of they liked parties much, but DBA decided that if she was going to go, Saiki had to go as well. 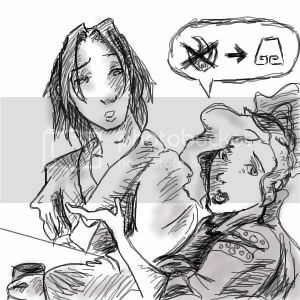 DBA was half-hidden in her oversized sweatshirt, and Saiki wore her typical tunic and pants, although DBA had convinced her to leave the knife and pack back at home. As soon as they were completely in the room, DBA released Saiki, who immediately headed for a shadowed corner to sit in. DBA however, headed directly for where the food was laid out and plunked down the bag of chocolates that she was carrying. She looked curiously at the pair ((Elizabeth and Hyana)) crouched under the table. "Uh....what are you two doing?" "Trying to get Abeni out from under the table, I guess," Sakura said. She waved at DBA. "Hi. I'm Sakura. We've never really had a chance to talk. What's your name?"